Fundamental to any Ayurvedic self-care routine is the proper feeding and nourishing of one’s 5-elemental body. As an appreciative student of Ayurveda, I’m in awe of the logic and cohesiveness surrounding the guidelines for diet and food preparation. But putting theory into regular practice ~ that can be a tall order especially in the summer when the structured cooking routines of the rest of the year take a back seat to summer’s spontaneity. Thank goodness Ayurveda’s emphasis on moderation extends even to the approaches we take to change long-engrained dietary habit patterns ~ gradually and mindfully are the way to go. Here are a few tips, strategies, and recipes for the current season that are helping me reshape some long-held, rather non-Ayurvedic dietary patterns. You may want to make modifications to be sure they fit your state of digestion and any imbalance you might be experiencing. Keeping the number of ingredients in my meals to a minimum not only saves times in food preparation and clean-up, but also makes it easier to follow suggested Ayurvedic food combinations. I found it helpful to keep a Food Combining Chart posted on my refrigerator. (I use Dr. Vasant Lad’s guide https://www.ayurveda.com/pdf/food_combining.pdf.) As for the foods themselves, we’re fortunate to have a small garden to insure just-picked freshness. Local farmers’ markets are your next best bet for prana-rich, seasonal, organic foods. Also make a point of checking all your major grocery chains for which ones carry the freshest locally grown produce. Some are definitely better than others. Here is a quick and simple recipe that works well for breakfast or a light evening meal. It uses late summer produce and has a pitta-pacifying sweetness. It also crossed nicely into autumn. Toast nuts until lightly browned (about 5 minutes at 350 degrees). A toaster oven helps keep the kitchen cool. Set aside when done. 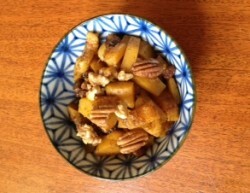 While nuts are toasting, place diced squash and dried fruit in a medium-sized saucepan with enough water to cover. Bring to a boil, place a lid on the saucepan, then lower heat and simmer until squash is tender and easily pierced with a knife. Strain and set aside. In the same saucepan, melt ghee or coconut oil. Add cinnamon, cardamom, and the cooked squash/dried fruits. Stir until combined. Serve sprinkled with toasted nuts and drizzled with a dab of maple syrup if desired. With pre-prepped squash, this dish is done in about 15 minutes. *Time-saving tip: In your grocery store produce department, look for fresh squash already peeled and cut-up. Granted, there’s some sacrificing in the area of freshness. To move away from leftovers and still save time in the kitchen, I try to come up with new ways to consume what I prepare within a 24-hour window. This is not perfect, but for practical purposes, a cooking-once-eating-twice strategy is a vast improvement over my old habit of making a big pot of something on Sunday and eating it all week long. I found that in relatively short time, I could prepare dahl or hummus in the morning for my midday meal, and use a portion of it as a great base for making an evening soup. By simply adding lightly steamed veggies and their cooking water, I get a whole other meal. If the soup needs more body or if I want to enhance the flavor, I stir in a bit of olive oil or ghee and add in a pre-mixed churna. Process until smooth. Adjust seasonings adding ground pepper and Himalayan pink salt if needed. Eaten with sprouted grain bread and a salad (say, cucumbers and dill for their cooling properties), this makes a nice mid-day main meal. Steam some fresh, quick-cooking, chopped vegetables such as zucchini, swiss chard, and/or string beans. Once they’re done, strain out the veggies and stir enough left-over hummus into the cooking water for a creamy, light base. Add back the veggies, a bit of olive oil or ghee, and a teaspoon or so of a spice mixture of your choosing. Add Himalayan pink salt as needed. – When you want to streamline cooking time, look for legumes that cook quickly such as split mung beans and red lentils. Soaking the legumes overnight reduces gas and further shortens cooking time. The more experimenting I do, the deeper my appreciation runs for the wisdom of preparing and consuming foods using the principles of Ayurveda. For me, the Mung Sprout Salad with Toasted Sesame Dressing provides a direct experience of how including 6 tastes in one meal creates a wonderful sense of satisfaction and completeness. This recipe is pitta-pacifying with astringent, cooling, and sweet qualities, yet doesn’t seem to disturb my vata nature. To my taste and experience, the lubricating feel of the toasted sesame oil adds warming, moistening qualities to keep my vata in check. The Sprouted Quinoa Tabouli with Summer Vegetables only seems to hit the spot in the summer, driving home for me how seasonal fare truly does jive with our body’s natural intelligence. (I’d tried the same dish in other seasons with vegetables shipped from afar and it just doesn’t work at all!) If you prepare these recipes in the morning for midday consumption, remove them from the refrigerator about an hour before mealtime so they’re not too cold when it’s time to eat. This recipe comes together very quickly; you make the dressing in the same bowl as the salad. Garnish with a few fresh cilantro leaves. Cut-up vegetables that you can digest easily and enjoy heartily, e.g. several halved, fresh cherry tomatoes; sliced celery; cubed cucumbers; shredded carrots; zucchini; possibly a few olives. After cooking quinoa, allow it to cool a bit, then add a tablespoon or so of olive oil, some freshly squeezed lemon, salt and pepper to taste, and if your digestion permits, a tiny bit of crushed garlic. Stir together. Then stir in the cut-up vegetables. 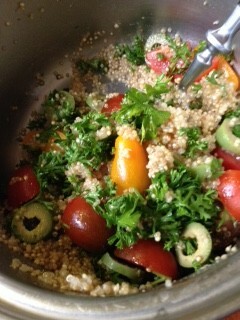 Add a generous handful of chopped parsley and a small amount of chopped mint. If your digestion allows, a bit of crumbled fresh feta cheese goes well in this salad. – I buy mung bean sprouts in the Asian section of the produce department. Perhaps someday I’ll incorporate sprouting grains and seeds into my routine. But that day has not yet arrived. – Use sprouted grains such as TruRoots brand sprouted quinoa. It cooks in less time and doesn’t need to be rinsed. If using regular grains, do rinse and soak to reduce cooking time. – Try to minimize the use of utensils for speedier clean-up. In both of these recipes, I use only one container to cook/prep and mix: The dressing is made and the ingredients are tossed in one bowl for the sprouted mung salad, and the quinoa is cooked, dressed, and all ingredients are added to the same pot for the tabouli. – Regarding tabouli, Ayurvedic food-combining guidelines suggest avoiding lemons with cucumbers and tomatoes, and staying away from nightshades with cucumbers and dairy products. You may want to experiment. I’ve found if I eliminate cucumbers, this recipe works well for me; sometimes I do well with the addition of feta cheese, other times it doesn’t digest easily. The difference between frantic multitasking and Sattvic multitasking is all in the intention and the state of mindfulness I bring. I’ve found on those days when I need to seriously compress my morning routine, I set up my yoga mat in view of the stove. This is especially helpful if I’m preparing something that needs to be stirred, expresses starch, or has the potential to scorch if I’m in another room where I invariably lose track of time. This strategy stays Sattvic only when I hold the clear intention that both actions – cooking, and conscious movement and breath – are preparing my sacred 5-elemental vessel for skillful action in the lovely day that lies ahead. February, Kapha’s Playground… and the longest month of the year!